Scheduling employees takes a lot of time. Whether on a piece of paper or in an Excel spreadsheet scheduling template, forecasting how much labor you would need and who was actually available to work takes hours. With an online schedule maker, the scheduling process no longer has to be such a time consuming task. Here are the top six ways an online schedule maker can save you time. 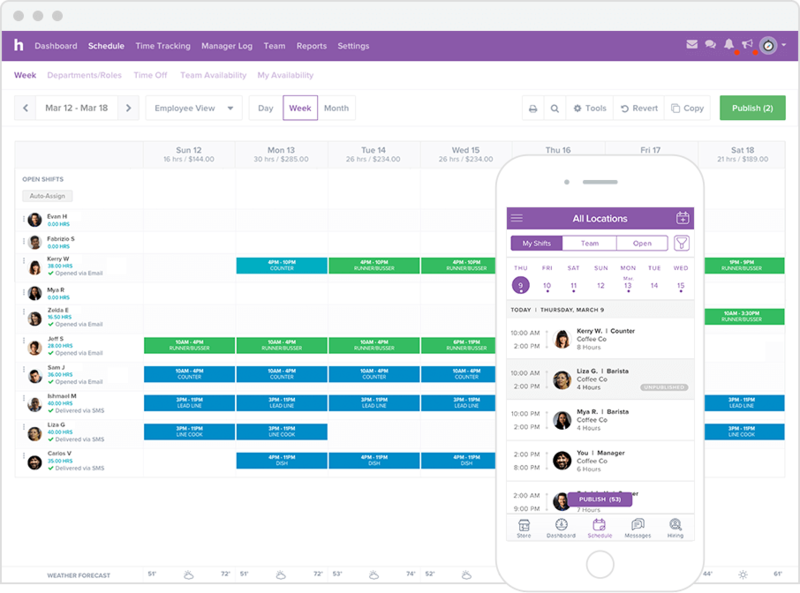 The first time you use an online schedule maker you will be amazed at how smooth employee scheduling can be. Instead of copy-pasting cells in Excel or erasing and rewriting names and shift times, you will drag and drop to create your schedule. This makes it easy for you to gain a holistic view of your schedule. It gives you the ability to view your schedule by role, time, or employee. The hours you’re assigning to employees calculate automatically so you can keep track of your labor costs. Being tied to your computer as a business owner or manager is problematic. You want to spend more time with customers and less time on your computer. With an online schedule maker you can create your schedule on your mobile phone or any browser to give you the flexibility and freedom you need. Especially if any last-minute schedule changes come up while you’re busy with customers. Schedule changes are inevitable and when your employees are in the know, that improves the likelihood that they’ll make it on time. Reducing schedule errors and no-shows is every manager’s dream. And online schedule makers like Homebase can help. When employees always have access to the most recent schedule, they can plan accordingly and get to work on time. Or even swap shifts if something comes up. Shift swaps used to require a combination of phone calls, texts, emails, and in person conversations that were difficult to keep track of. With the help of an online schedule maker, you’ll be notified when shift trade requests come up and be able to approve them from anywhere. First, you decide if the shift swap will work. Then Homebase checks and warns you if the change created any conflicts or put an employee into overtime. Otherwise, it automatically updates and sends notifications to employees via text, email, or within a mobile app. Scheduling is not a one and done task. The best online schedule makers are easy to copy over to the next week. If you have a consistent schedule week over week, save yourself even more time by putting your schedule on auto-pilot. You’ll always have the opportunity to make small changes when needed. But those schedule tweaks should take minutes, not hours. Knowing your labor costs is critical. That means tracking how many hours your employees are working and how often they’re working overtime. These metrics are crucial to staying on budget, when combined with your sales data. The most effective online schedule makers like Homebase connect with your POS. That way, you can forecast sales against labor costs and keep all your expenses in line. You’ll be able to spend less time worrying about costs and more time thinking about growing your business. Saving time where you can is the name of the game for businesses of any size. Whether you run a bakery with five employees or a landscape design firm with 15 employees in four different roles, making sure you’re always properly staffed is key to your business’s success. Ready to try an online schedule maker? Homebase has a free employee scheduling tool that saves businesses hours each week. Sign up for free here to automate scheduling and time tracking with Homebase.